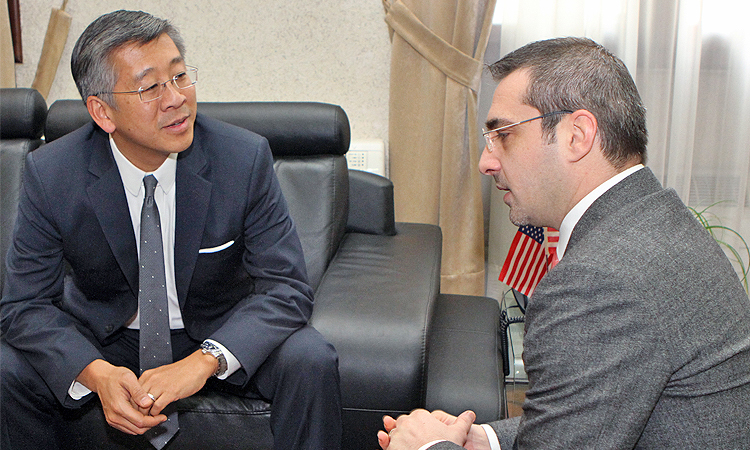 US Ambassador Donald Lu and former Minister of Interior Saimir Tahiri. There have been many reports in the US and international media about the disarray in the US Department of State, with a steady outflow of qualified diplomats and a record number of positions requiring US Senate confirmation unfilled. Only in October 2017, the position of Assistant Secretary of State for European and Eurasian Affairs, formerly held by Obama-appointee Victoria Nuland, was filled by Wess Mitchell. Before Mitchell’s appointment, Deputy Assistant Secretary for European and Eurasian Affairs Brian Hoyt Yee was largely in charge of State Department policy in the Balkans, and as such played a crucial role around the Albanian parliamentary elections of 2016. However, at his recent first trip to the Balkans, a region of crucial strategic importance for the US, Mitchell avoided Albania, while visiting Kosovo, Macedonia, Serbia, Greece, and Cyprus. This in itself shows the failure of the US diplomatic mission in Albania. This has become all the more clear in Lu’s interview with Blendi Fevziu on April 4, in which he looks back on more than three years as US Ambassador in Albania before leaving his post this summer. It appears that the void left in the US State Department has allowed Lu to freewheel his ambassadorship. Lu then continued by giving three recent examples, none of which were actually politicians: Met Kanani, a drug trafficker who was recently arrested in Turkey apparently “with the help of the Albanian government” and Arbër Çekaj, who was responsible for trafficking the 613 kg of cocaine found in Maminas, but who was allowed to escape due to the inaction of law enforcement forces. Lu’s third example was Klement Balili, “Escobar of the Balkans,” whose property was only confiscated more than a year after Greece released an arrest warrant. Like Çekaj, he has not been arrested. In fact, in December 2016 Lu had openly criticized the Albanian government for not arresting Balili, but now it seems as if he is just happy that there is an “international arrest warrant.” As Lu declared to Fevziu: “We, the Americans, believe [Balili] is still in Albania and there is the possibility that he will be arrested in the coming days.” But we have heard this before. Fevziu then moved the conversation in the direction of Saimir Tahiri, the former Minister of Interior and right hand of Prime Minister Edi Rama, directly implicated in a drug trafficking organization involving also his cousins, the Habilaj brothers. Although the Socialist Party refused to allow Tahiri’s arrest, prosecutors ordered the arrest of several regional police directors close to Tahiri, all of whom managed to flee the country. The recently leaked prosecution files on one of them, Jaeld Çela, again confirms Tahiri as part of the Habilaj drug trafficking organization. It is not up to me to say whether Saimir Tahiri is guilty or not. […] You are not judges or prosecutors, but people who vote. You’ve given your trust to this person as member of parliament and as an important minister in the government. It is your right to demand that the public knows the truth about this issue. If he is innocent, the people need to know this. If he is guilty, he has to face justice. We are not close to the end of the case, but it is the position of the US government and the US Embassy that the issue against Saimir Tahiri deserves to be decided by a judge, not to be decided by politicians, not to be decided by prosecutors who don’t do their work, but it has to be decided by a judge who would transparently consider all evidence on the case. Not a word about the Socialist Party blocking the arrest of Tahiri. Not a word about the fact that ever since Arta Marku was unconstitutionally nominated Temporary Prosecutor General, with the support of the US Embassy, the Tahiri case has been slowed down considerably. With “prosecutors who don’t do their work,” however, Lu certainly didn’t mean Marku. He referred to former Prosecutor General Adriatik Llalla, whom Lu openly attacked in the past. However, if we look objectively at the tenure of Llalla as Prosecutor General, we can observe that he was actually the first one to seriously investigate politicians, although with little final result: the cases against Tahiri, former Minister Spiro Ksera, former Minister Ilir Beqaj, former Governor of the Central Bank Ardian Fullani, former Kavaja mayor Elvis Rroshi, Durrës mayor Vangjush Dako, former Vlora mayor Shpëtim Gjika, and Socialist MP Alfred Peza were all opened under Llalla’s watch, in addition to several MPs that were indicted under the decriminalization Law. So far, it seems, Llalla has performed much better than Marku, who has presided over the illegal extradition of Nezar Seiti, a key witness in the prosecution’s case against Tahiri, the escape of the drug trafficker Arbër Çekaj, and the release on bail of Orest Sota, who had been captured with €863,000 in cash and with two boating licenses of Tahiri, and features prominently in the Jaeld Çela dossier. In the interview with Fevziu, Lu openly declared that “we also know that there is an investigation underway by the prosecution against [Llalla] for corruption. This investigation is supported by the US government.” Rumors about such an investigation were recently reported by Deutsche Welle from “a diplomatic source,” but inquiries of Exit at the Prosecution Office revealed that no such investigation is currently underway. So what are we to think of the fact that Ambassador Lu openly declares the “support” of the US government for an investigation into a former prosecutor that appears to be at least in doubt, while he calls for a “transparent” and unbiased judge in the Tahiri case, for whom severely incriminating evidence has been released in two different countries? Why the prudence with Tahiri and the recklessness when it comes to Llalla? In fact, according to the US Department of State website, the main challenge for US law enforcement support in Albania are “[t]ransnational organized criminal networks based in the Balkans [that] have a direct impact on the U.S. through criminal activities, some internet based and some through trafficking.” Moreover, US President Donald Trump and Attorney General Jeff Sessions recently ordered all federal investigators to ask harsh punishment for drug traffickers, including the death penalty (which, for the record, I find despicable). So it appears that the drug trafficking case of a former Minister of Interior should be much more urgent for the US Embassy than the alleged corruption of a former Prosecutor General. The reason for this curious situation is not difficult to find. Whereas Ambassador Lu was personally responsible for shepherding Saimir Tahiri into a meeting with former US President Barack Obama at the White House in February 2015, Adriatik Llalla has openly criticized the US Ambassador for intervening into an investigation of environmental damages caused by Bankers Petroleum in Fier, demanding Llalla to stop the investigation. So it turns out that the different attitudes shown in Lu’s interview toward Tahiri and Llalla are not the result or reflection of US government policy. They are the result of the personal actions and feelings of the US Ambassador. And at the moment that these take precedence over actually representing his country in such a way that further its strategic interests, one wonders what happened to US diplomacy.